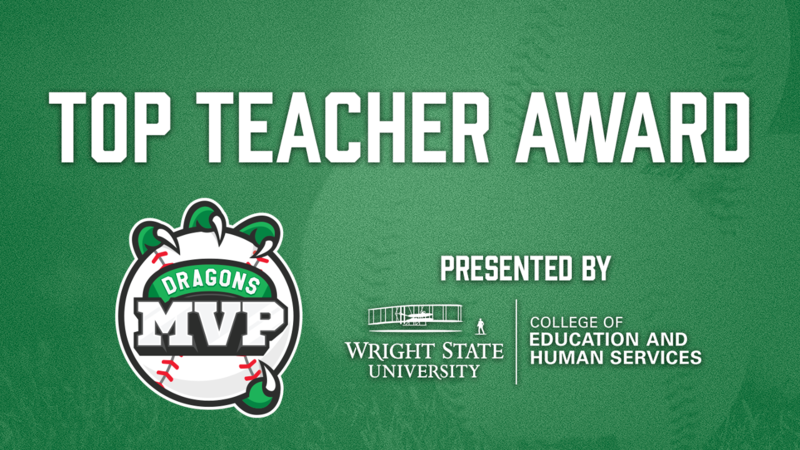 Dayton, Ohio - The Dragons and Wright State University's College of Education and Human Services will honor two local teachers as a Dragons MVP Program Top Teacher next week. These two Top Teacher Award nights will take place on Monday, April 15 at 7pm and Wednesday, April 17 at 7pm, when the Dayton Dragons take on the Fort Wayne TinCaps at Fifth Third Field. The Dragons MVP Program Top Teacher Award honors teachers for their outstanding accomplishments in his or her classroom and community. Top Teachers will also be highlighted during a special inning break during a Dragons game. Denise Kline - "I believe in trying to make the world a better place." Denise Kline is a 5th grade teacher at Dixie Elementary School in Montgomery County. She has been teaching at the school for 21 years and is the lead teacher that coordinates the Dragons MVP Program. Denise's favorite part about being a teacher is empowering kids to have the self-confidence to make a difference in the world. For her dedication to go above and beyond for all of the students at Dixie Elementary School, she has been selected as a Dragons MVP Program Top Teacher. The Dragons and Wright State University will be honoring Denise Kline at the game on Monday, April 15th. Lynn Jenkins - "I was meant to be a teacher. It is what I enjoy doing!" Lynn Jenkins is a 4th grade teacher at Kings Mills Elementary School in Warren County. She has been teaching at the school for 31 years and her favorite part about being a teacher is spending time with the kids and getting to know them. Lynn believes she was meant to be a teacher and it is what she enjoys doing. For her dedication to go above and beyond for all of the students at Kings Mills Elementary School, she has been selected as a Dragons MVP Program Top Teacher. The Dragons and Wright State University will be honoring Lynn Jenkins at the game on Wednesday, April 17th."